This closing event offered a final opportunity to discuss the exhibit with the artist and curators. Artist Marie Christine Katz presented the culminating performance of “Knitting… i need you” an ongoing interactive project featuring ongoing knitting lessons and a Twitter guided walk Let’s Take a Walk at OSH. Artist and musician Robert James Anderson also played several songs using OSH’s piano combined with digital recordings. In addition, the new Brooklyn Utopias Exhibition Catalog was available for purchase. MTA Arts for Transit and Urban Design led this unique tour to visit some of Brooklyn’s newest public artwork. Deputy Director Amy Hausmann and special guest artists explored site-specific works installed throughout Brooklyn from Atlantic Avenue to Coney Island including works by Allan and Ellen Wexler, George Trakas, Owen Smith, Francesco Simeti, Portia Munson, Dan Zeller, Christopher Russell, Xin Song, Amy Cheng, Odili Odita and more. Brooklyn Utopias curator Katherine Gressel also gave a brief intro to the exhibition at the Old Stone House, with the option to visit after the tour. Brooklyn Utopias: In TRANSITion, in partnership with the Old Stone House and the NYC Department of Transportation’s Urban Art Program (DOT), is pleased to present a temporary public art installation on 4th Avenue by Emily Weiskopf. By humorously raising the yellow lines that separate 4th Avenue’s traffic lanes, Unparallel Way questions and heightens awareness of the parallel paths we all follow, suggesting suggesting alternatives in a playful perspective. Our official opening ceremony on October 28 featured presentations by members of DOT and OSH. This panel brought together transportation and urban design experts with artists and curators to discuss how transportation decisions are made, with a specific focus on the role of artists in design and advocacy. Topics included recent citywide initiatives to involve artists in streetscape planning; artists’ attempts to mediate and raise awareness of common transit problems; and the impact of the upcoming mayoral election. As part of Open House New York weekend, OSH is hosting the 2nd annual Kings County Fiber Festival. 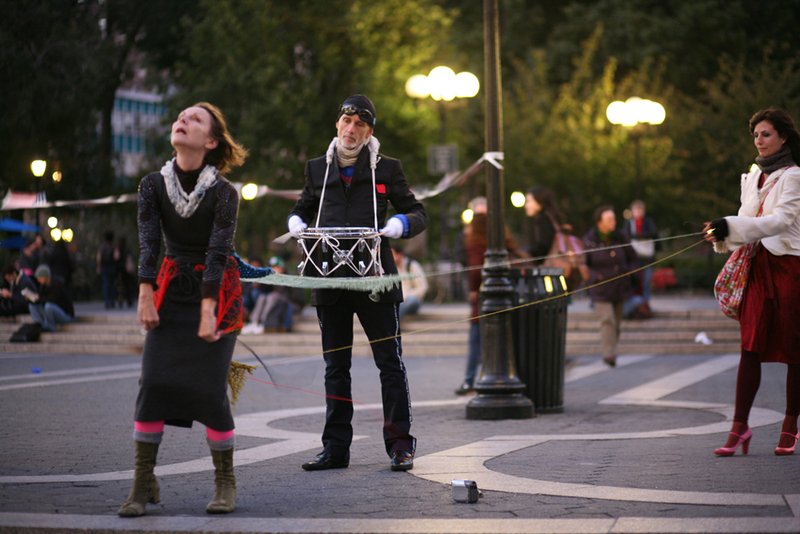 As a continuation of her opening night “Let’s Take a Walk” performance, Marie Christine Katz will be present at the festival to teach basic knitting techniques and collect stories about experiences of walking in the city. Throughout the day she will retell the stories given by participants via short, seemingly impromptu, performances, while the knitted elements are unraveled. Exhibition on view through January 12, 2014. Visit our Upcoming Exhibitions page for more information! Learn to knit, and explore how walking can prompt communication and bring people together in an urban environment! Katz conducted a group walk at the opening reception; people could also participate virtually via Twitter. The walk had tweeted directions, a drummer, a town crier and a Tweet Master. Dress fragments that were created prior to the event unraveled during the journey, and were displayed outdoors. Along with walking directions, Katz interjected historical fact and stories told during knitting sessions leading up to the event. Visitors could take part in the knitting sessions which provided the source material for “Let’s Take a Walk!” The artist was in Washington Park outside the Old Stone House Sept. 12 -13 from 3 to 5pm, and Sept. 14-15 from 4 to 6 pm. She invited visitors to knit with her, and share personal stories during the knitting lessons about experiences of walking in the city. Art workshop with Petra Valentova: Help create her “In TRANSITion” installation! Visitors helped artist Petra Valentova create her upcoming installation for Brooklyn Utopias exhibition. Petra Valentova’s large wall mural at OSH, “Polystory/episode 4: Brooklyn 4&4,” depicts the corner of 4th street and 4th avenue which is an area slated for traffic calming measures to make it safer for pedestrians (see below image). At this Tuesday workshop, Valentova asked participants to brainstorm what they would like to see on 4th Avenue instead of cars, and draw with pastels. 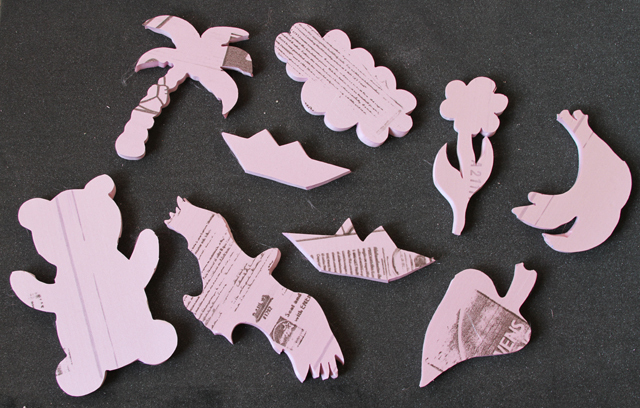 Their drawings were then translated into magnetic Styrofoam objects to be used in the exhibit. Visitors were able to arrange these objects to cover a spray-painted silhouette of a car on the wall, “forcing” the car to ‘disappear”, and “replacing” it with the objects that the people in the community would prefer to see on 4th Avenue. Please see the archive of Past Events to learn about the 2012 Brooklyn Utopias: Park Space, Play Space events.